Upcoming Earth Day has us spinning on axis (get it). Earth Day was founded in 1970 as a day of education about environmental issues. The brainchild of Senator Gaylord Nelson and inspired by the protests of the 1960s, Nelson hoped that by raising public awareness of pollution he could bring environmental causes into the national spotlight. The holiday is now a global celebration that takes place each year on April 22nd. Now the only question is what can your brand do to celebrate sustainability and our great green planet? Get your brand on board with eco-friendly products with promotional, but more importantly reusable, straws. By now you’ve probably heard a little bit about this reusable straw thing. But in case you haven’t, here’s a few facts for you. The trend really started to take hold in July 2018 when Seattle became the largest U.S. city to ban plastic straws. 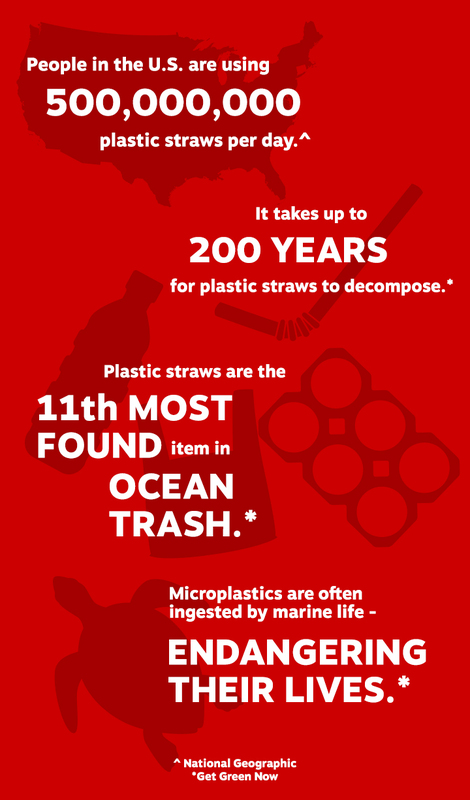 Companies like Starbucks and McDonalds are also on board, starting initiatives to phase out plastic straws in their establishments. Basically, plastic straws are out. Earth Day provides the perfect in for your brand to gain some ground with sustainability-friendly practices and eco-friendly customers. Showing your customers that you care about the environment drives engagement, consideration and conversation from your audiences. Not only are you giving them a trendy product, but also a real way to decrease their footprints and start immediately making a difference. After all, we’ve only got one Earth. We better treat her right. Reusable straws aren’t the only way trendy way to treat the Earth with respect. Have you heard of plogging? This new trend constitutes a growing movement of joggers who pick up trash along their daily runs. Consider combining initiatives and offering branded reusable straws or other green products as rewards for any employee who participates in a nice morning plog. Not drinking these ideas up? Staples offers hundreds of environmentally-conscious brands and products that can help you spread your brand message while also spreading the message of sustainability. Contact your Staples Representative or email scs@staples.com to get started!